Bella Vista is pictured here carved from real solid white marble. It is a surround facing that has fine carvings in the shelf frieze and the legs. Unlike the Versailles it has legs that are forward facing versus at an angle. 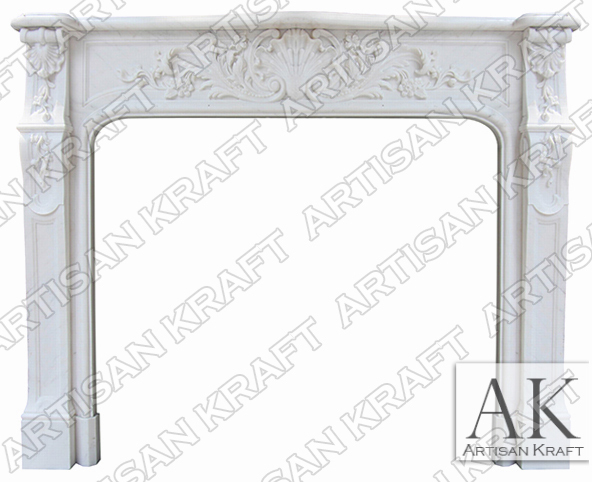 This is such a beautiful surround facing that we stock it in 3 different colors and materials. One is the travertine fireplace Bella Vista. The other is a dark brown marble mantel surround Bella Vista. All are equally beautiful and come down to color and style e preference. The travertine Bella Vista has an antique almost rustic look to it even though is it a fancy French design. The travertine and marble versions look very different because of the stone that is used. We love this model so much that we have two versions of it displayed in our Chicago Mantel Showroom.